A humble Hanoi capital pho shop that has served only one dish for 40 years has opened a second stall in Japan. No avid pho lover in Hanoi can be unaware of a nondescript shop on Lo Duc Street. What this eatery does to a bowl of beef pho is nothing really special, but regular customers, whose numbers are constantly increasing, will tell you that the only dish they serve, pho tai lan is one of best bowls of the noodle soup you can get in the city, or elsewhere, for that matter. You have take them seriously because this eatery, Pho Thin, has been serving this single dish for 40 years, and is still going strong. Pho tai lan is different because of the way it serves its main ingredient, the beef. The beef is briefly stir-fried in a hot pan with garlic and ginger first, then served with the noodle and broth. There is no other option in this place. Just this one dish. You cannot find stir-fried pho or chicken pho. But it has never lacked customers for 40 years and has won over many foreigners as well. Some people have said that given its longevity, this eatery should be upgraded to a "proper restaurant," but most just want the flavors, taste and cleanliness maintained. They do not care about its name or its visibility. The fragrance of the broth is enough to entice them. The broth pot is always boiling from morning till the afternoon, and the aroma of star anise and black cardamom spreads in the area. 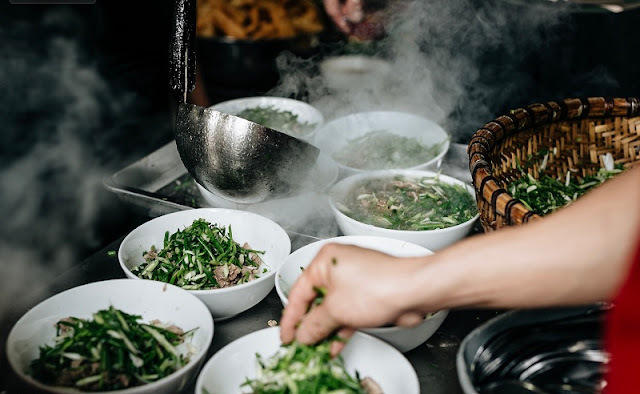 The owner, Thin, said that the broth recipe is the result of a long process of learning from the past, as well as from other pho makers in Hanoi. After it is stir-fried briefly, the beef is placed in a big basket and ready to serve. A worker said it was not easy to stir-fry the beef, adding that it required skill and experience to get it just right. Side dishes served with a bowl of pho here include quay, deep fried flour sticks, and poached eggs. You pay first before eating. A bowl of pho tai lan here is more expensive than the average stall at VND60.000 ($2.5). You can order quay for VND10,000 ($0.4)/three pieces and pay the same for a poached egg. The diner has no frills, but it’s clean. Customers enjoy their pho sitting on wooden or plastic tools at metal tables. There are several framed black and white pictures of old Hanoi on the wall and several newspaper articles that have been written about this pho place. "This might be the most delicious dish that I’ve ever tried in Vietnam. The broth is flavorful and the beef is very appetizing. I will definitely come back here," said Tibo Rivero, an American tourist. Despite its humble appearance, this eatery has gone a long way. Early this month, it opened a new chapter in its existence with a second stall in Tokyo, Japan. Not surprisingly, the initial reactions have been positive. Sapa Trekking Tours © 2016. All Rights Reserved.